This study interested in the synthesis and modification of mesoporous alumina monoliths in order to be used as a highly sensitive separating material for extraction of both U (IV) and Th (IV) ions selectively from real leach liquors. The adsorbent is prepared through functional immobilization of alumina with 2-Amino-1-thia-3,4-diazole. TEM, N2 adsorption/desorption isotherm; TGA, and elemental analysis were carried out to demonstrate the fabricated mesoporous adsorbent. The optimum adsorption conditions such as pH, time, and initial concentrations were investigated to study the adsorption behavior of the modified alumina for U (VI) and Th (IV). 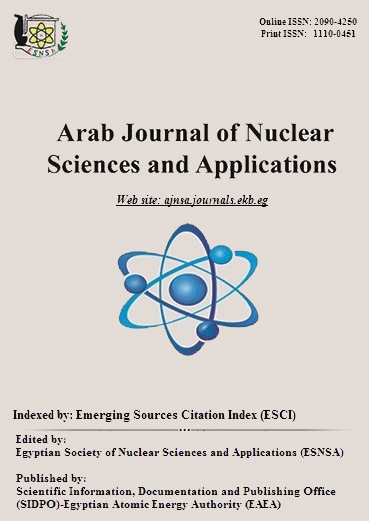 The obtained results demonstrate that, the adsorbent allow extremely efficient adsorption for U (IV) and Th (IV) ions at different pHs from the real matrix (Abu Rusheid, Egypt). The adsorption efficiencies of thorium and uranium are 80 and 85 % respectively. The loaded thorium is eluted firstly by 6M HCl then loaded uranium is eluted by 2 M HNO3. In addition, this study proved that in order to completely separation of U (VI) and Th (IV) from sulfuric acid of Abu Rusheid leach liquor it needs about 3 stages of sequential separation using alumina-ATDZ material.